It is quite distressing that Nigeria’s president Muhammadu Buhari is resurrecting the name of poor and dead Gadaffi as his attempted defense of the insecurity in Nigeria. The question to immediately ask is: why is it only Nigeria that is so affected by Gaddafi’s ghost? Why not Mali, Chad, Algeria, Niger and all other nations around Libya? Ruled and literally owned by a very wicked cabal, Nigeria has maintained status as the most terrorized nation in the world. Until these wicked cabal cease to hold the reins, Nigeria will not be free from wanton terror. Why are the so-called Gaddafi mercenaries enticed to come and seek employment in only Nigeria and no where else? Terror of all forms continues unabated in Nigeria, only changing from one form to another for the reasons listed below, which we will tackle once and for all when we come into power in 2019 God willing. Illicit funds: Nigeria’s commonwealth continuously looted by the cabal who continue to drain the economy of billions of dollars till date through CBN and NNPC FOREX subsidy scams and phony oil subsidy, phony oil swap and oil FOREX scams, allows unrestricted funds to sponsor all forms of terror in Nigeria. Reuters reported that in just 11 weeks examined, there was an illicit transfer of 100 million dollars to Dangote via the CBN FOREX subsidy scam. Until the masses take power in 2019 and block the flow of cash into the hands of the wicked few cabal, terror will continue in the nation. The continuous payouts by the Jonathan and now the Buhari government to Boko Haram terrorists and payouts by the current government to Fulani killer herders as confessed to by Kaduna state governor Nasir el-Rufai is a reason why Nigeria remains terrorized compared to neighboring nations where terrorists are not paid and thus there is no incentive for the so-called Gaddafi forces to seek employment. Both the Jonathan and Buhari government refused to arrest a single sponsor of Boko Haram or the so-called Fulani herder nomadic Boko Haram. Many members of the Borno state government including local government chairmen and even governors have been accused of terror sponsorship, but not a single arrest has been made. 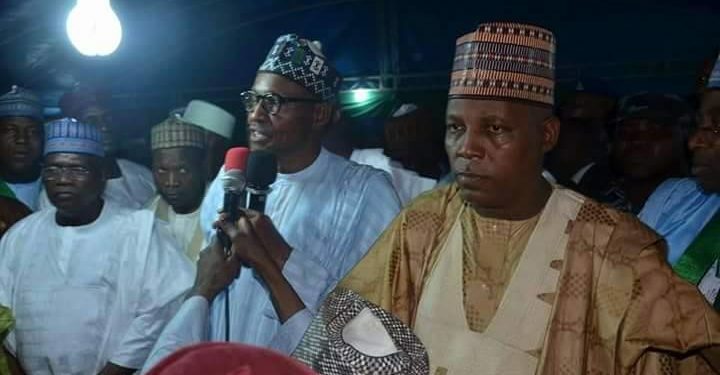 The current governor of Borno, Kashim Shettima severally admitted to knowing the sponsors of Boko Haram and is quoted to have said that if he spilled the beans, heads “of cabal” will roll. That is Nigeria for you. Senator Ndume, indicted for terror sponsorship was discharged because the Buhari government failed to bring arrested terrorist Konduga and suspects, VP Namadina Sambo and former AG Adoke to court. The government simply tossed the case. Terror exists in Nigeria because the sponsors enjoy limitless immunity as do all corrupt and killer politicians and cabal. Rather than arrest terror sponsors, under the Buhari government, many of the worst terror masterminds have been freed including the devil behind the Kano bomb attack that claimed 1000 Muslim lives who Buhari reportedly just freed in Dapchi appeasements. This is why Nigeria is the most terrorized nation and its neighbors are not. Nigeria’s police have been assigned to secure only the same culprit cabal with practically the entire police force used as bodyguards for the cabal and no officers left to secure the nation from terror. This of course does not happen in Nigeria’s neighbors. Due to this, Nigeria has been ranked as having the worst police in the entire world. How can terrorists from Libya not run around freely when there is no police in Nigeria. Unlike other neighbors of Libya, in Nigeria terror sponsors and publicly know groups like the Miyetti Allah cattle-rearer group make open threats of continued terror and violence and go unpunished. This does not happen anywhere else in the world and is a clear reason why terror continues unabated in Nigeria. These are some of the reasons why Nigeria is the most terrorized nation in the world. And these are the issues we will deal with once and for all in 2019 when we kick out the cabal by the special grace of the Almighty.